would only support it on the Mini version. With the cones being almost twice as tall as the standard cones, only 3 shelves can be utilized. for a total storage of 62 cones. 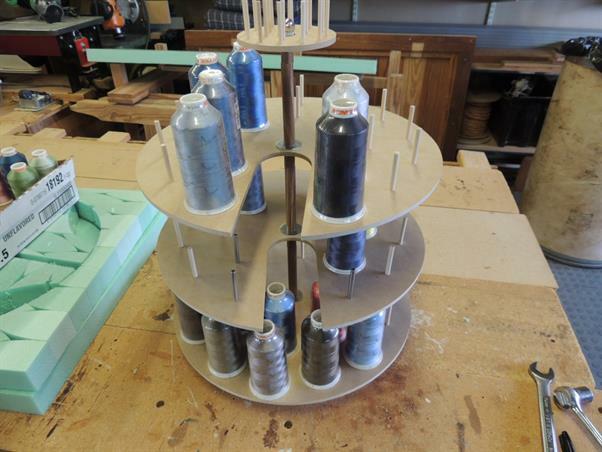 It does come with the bobbin storage that sits on top and can store approimately 90 bobbins. The distance between each shelf is 5-1/2", which will accommodate up to 5-1/4" tall cones, allowing 1/4" of clearance so the shelves rotate freely. Please feel free to leave any comments. If you would like to contact me directly, please click here to email me. Please be aware that the carousels are Patent Pending, and the plans are Copyright protected, and illegal to redistribute, copy, or sell. These first 5 photos are from my woodshop during the build of the prototype. The shelves have 4 steels pins near the access slot to offset the missing materal for the slot - this helps maintain the balance. The shelves are made of 1/4" MDF material, the base is solid wood, with 1/2" steel center support rod with 3" spacers between each shelf. The top 5 shelves have a 3" inch wide access slot for reaching in to retrieve and re-position the spools. Each of the upper 5 shelves have 4 steel pin to counterweight the access slot. her photos you can read her comments. 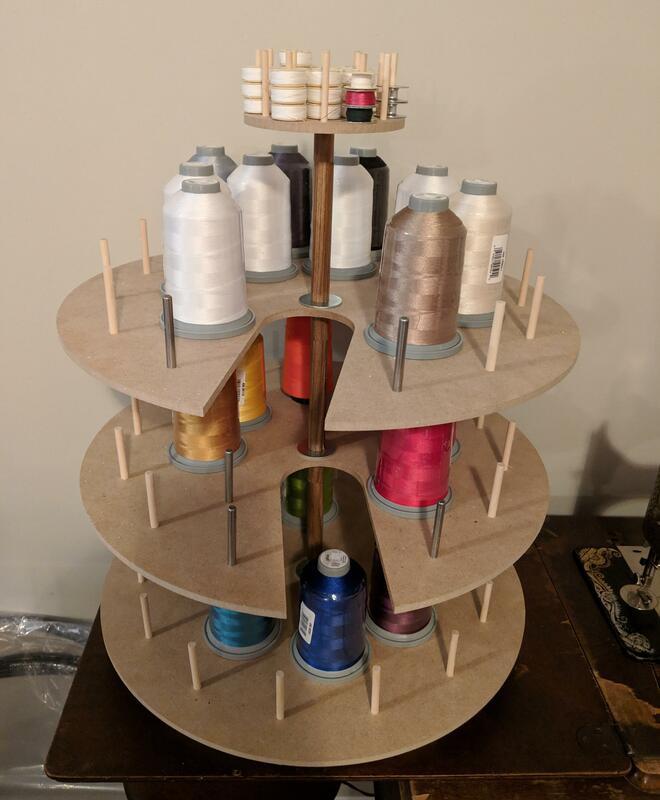 I got the thread carousel late yesterday evening and immediately put it together. It is perfect! 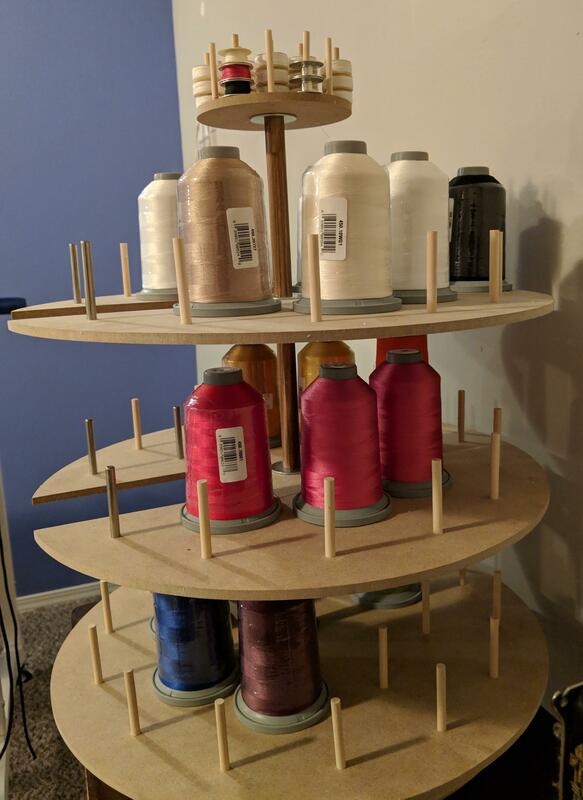 The spools fit easily on the shelves and it was so easy to put together. I've already put all of my thread on it. I've got plenty of open space so it looks like I'll have to buy some more! Thanks again so much! It seems to be sturdy so far. I'll continue to add more thread and keep you updated! The spools I used are 5000M. I'm not sure why they are shorter than yours. I'm specifically using the Glide brand of thread so it may be a company decision. It was very good at to put together and I do believe it it sturdy enough to support another shelf. I'm not sure about the alignments pins but I personally like for things to look neatly organized so that is important to me but may not be a concern to anyone else. You can absolutely use the pictures I sent you. I'll continue to use it and add more threads and let you know I come across anything good or bad. 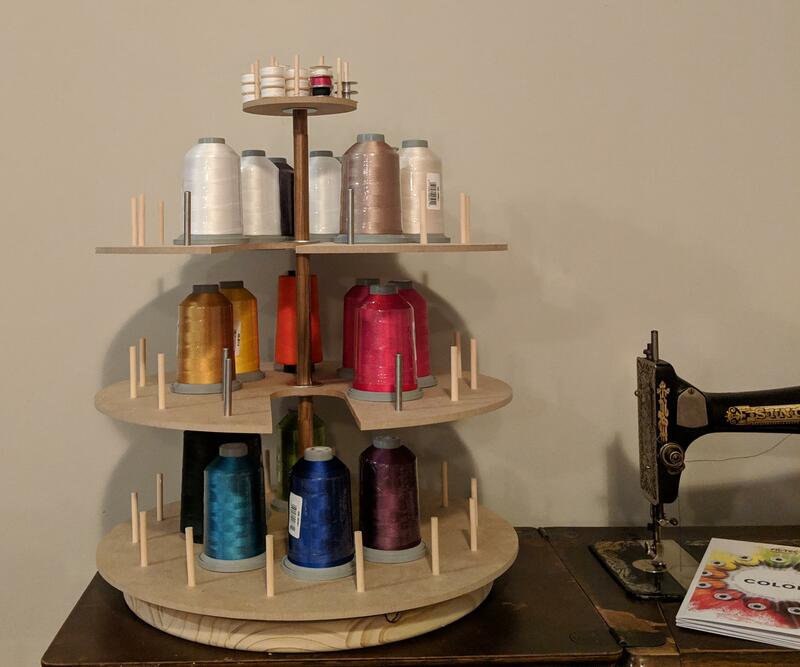 So far I am very happy with it and it is a welcomed edition to my sewing room. I really appreciate everything you've done! the spacing @ 5-1/2" to accommodate the taller and different brand spools. Please include a contact phone number when you order through PayPal, this is required by Fed-Ex Home Delivery for delivery purposes. To purchase the Mini LC 17", or the Mini 17LC and wheels select your choice from the dropdown and click the BuyItNow button below to complete your purchase. Click the YouTube video below to view the actual assembly of the new large cone storage carousel - Mini 17LC. You will see just how easy is goes together. It also shows the carousel with the optional wheels.